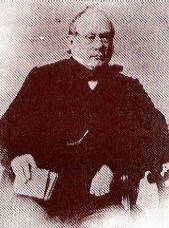 Samuel Collins was, for many years the acknowledged leader of the Strict Baptists in the county of Suffolk. He was born in Culworth, Northamptonshire on 24 December 1799. His parents were godly, being members of the Church of England and he had a great love for them. As a young man, he worked in a drapery shop in Banbury and on one occasion, in the market place he read aloud the account of the battle of Waterloo to a very attentive audience most of whom were unable to read. Leaving Banbury he moved to London in pursuit of his livelihood. He was converted and joined the Baptist Church then at York Street, St. James’ afterwards at Meard’s Court, Soho where John Stevens was Pastor. He was encouraged to preach but on the first occasion, with his pastor in the congregation, he was overcome with nervousness, but Stevens encouraged him. ’All right, Sam: if you can get through a muddle like this, I can trust you anywhere’. In 1826 with the full agreement of John Stevens he preached for the first time at Grundisburgh, Suffolk on Titus 2:14. He became the Pastor later in the same year. The Baptist Church at Grundisburgh was already in a flourishing condition with a membership of around 300 but this prosperity continued. Collins remained at this church until he retired in 1876. By then he had baptised about 400 and 8 men had been sent into the ministry. There were 10 village preaching stations supplied by Collins and other members of the church. In the latter half of the 1820s a dispute took place in the Norfolk and Suffolk Association of Baptist Churches regarding “Duty Faith.” A number of churches were prepared to assent to the views of Andrew Fuller as formulated in his book “The Gospel Worthy of Acceptation”. In October 1829 those Churches which rejected this teaching formed “The New Association of Strict Baptist Churches” at Grundisburgh. Although the church did not actually join this association for three years, Collins was from the first one of its most ardent supporters and he later led it as moderator on twelve occasions. In 1832 he devised a plan to produce a cheap monthly magazine for the Strict Baptist Churches and the following year the first number of The Gospel Herald was produced. For a number of years, he took the whole responsibility for its publication and editing. In 1875 after many years of prosperity, the church at Grundisburgh had to accept the resignation of Samuel Collins due to failing health and chronic disease. He was loved by his church and his departure was regretted by many. Early in 1880, he suffered a stroke which brought an end to his public ministry. He died on 17 July 1881. Dix Kenneth, Strict and Particular: English Strict and Particular Baptists in the Nineteenth Century, Didcot 2002. Klaiber Ashley J The Story of the Suffolk Baptists, London 1931.